Many people mistakenly believe that tooth decay, bad breath, and gum disease are simply a part of life. They don't have to be! Our family dental practice emphasizes prevention, which means that we partner with our patients to defend against common dental problems. Dr. Boehmer and our oral hygienists can help you maintain an "au naturale" smile that you'll be flashing well into your golden years. Dr. Boehmer encourages patients of all ages to attend at least two professional checkups each calendar year, or one per every six-month period. Even if you brush and floss diligently at home, dental decay and other serious damage can develop in subtle, gradual ways that may go unnoticed. 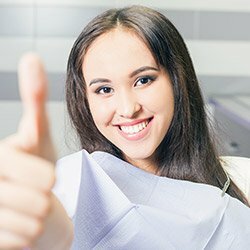 Our team will perform a comprehensive examination of the teeth, the gum tissue, your resting bite, any restorations like crowns and fillings, and more in order to fully understand any present concerns and formulate a custom treatment plan. Over time, plaque (a clear, sticky deposit that contains harmful bacteria) is constantly developing on the tooth enamel surfaces. While it can be cleared away easily enough with good oral hygiene techniques, even the smallest missed areas can build and build over time, eventually developing into hardened tartar. This is why we strongly recommend attending professional cleanings on a routine basis. One of our outstanding hygienists will use special instruments to clear away dangerous bacteria and polish the teeth, helping to prevent not only cavities, but the onset of periodontal (gum) disease as well. There's no way to sugarcoat it - bad breath is embarrassing. We feel your pain, and we can help! Bad breath usually stems from poor oral hygiene; patients who don't floss regularly are especially at risk. There's no instant cure for bad breath, but with careful instruction, a little extra time spent at the sink each night, and regular dental cleanings, bad breath can be controlled. Oftentimes, bad breath is a sign of early-stage gum disease, so visit our office pronto for an exam and further instruction. 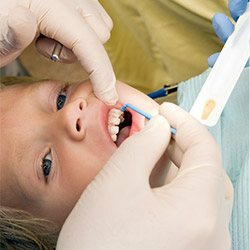 The ADA recommends that children begin seeing a dentist no later than age one. We also recommend bringing your son or daughter with you to your dental visits. 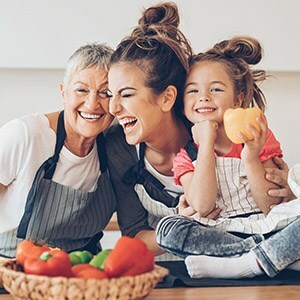 At this young age, we can begin creating positive associations with dental visits – associations that will hopefully carry into their adult years and shape the future of their dental care. We also educate children on home oral care, examine their teeth, and provide cavity-preventing treatments. Let us help your children learn the importance of optimal oral health from a young age. Bruxism (more commonly known as “teeth grinding”) is a widespread bad habit that negatively impacts smiles of all ages. Many patients don’t even realize the gradual damage they’re causing to their teeth because they only experience symptoms while asleep and unaware. If chronic jaw pain and worn-down tooth surfaces are common for you, don’t wait any longer to schedule a consultation with Dr. Boehmer. 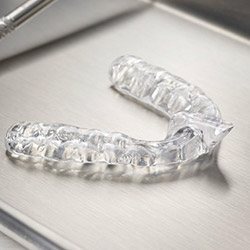 She can create a highly personalized nightguard that will protect the rows of teeth and prevent dangerous contact while you rest peacefully. TMJ disorder (also known as TMD) is a complex and harmful oral health problem that can lead to severe, even debilitating daily symptoms. It’s caused by dysfunction and strain in and around the temporomandibular joints, which connect the lower jaw to the skull. 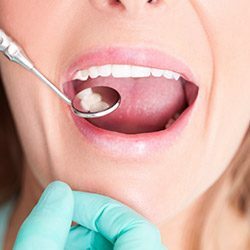 Dr. Boehmer has studied neuromuscular dentistry extensively at the Las Vegas Institute, and she can address the disharmony of these oral structures with effective therapy techniques to relieve chronic pain for good. 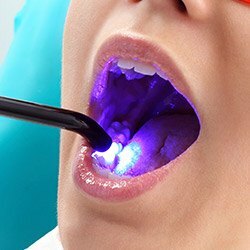 Oral cancer is a very common disease, with tens of thousands of new cases discovered every year. Full recovery is possible and even likely, but only if the cancer is discovered early in its development. That’s why Dr. Boehmer has incorporated dedicated screenings into every routine checkup here in her Albuquerque practice. She will scan the oral tissues for tell-tale indications, such as red/white discoloration, slow-healing sores, and strange crusts and lumps. If needed, a biopsy can be arranged to provide a concrete diagnosis. When using toothpaste or drinking tap water, it’s likely that your smile is being exposed to the mineral known as fluoride – and this is good news! Fluoride is essentially nature’s cavity fighter, helping to remineralize tooth enamel and reduce a person’s overall risk of tooth decay. Dr. Boehmer may recommend professional fluoride treatment in the form of a topical application during you or your child’s next checkup and cleaning. This process only takes a few minutes, and the benefits are well worth it.